I could tell you that the story of NYC marathon Sunday was the 20+ mph headwinds for 20.5 miles, the wind gusts to nearly 50mph, the crosswinds that snatched your feet out from under you, or enduring bone chilling 20 something degree wind chills for 4 hours waiting for the run to begin. I could tell you that 5 layers of clothing and 2 heat sheets were not enough to keep you warm at Fort Wadsworth. I could tell you that the weather conditions were so severe, that the race organizers had to modify the start for the wheelchair division athletes — so that they avoided the 2 mile Verrazano Bridge. I could tell you how I watched the winds rip loosely fitted clothing right off runners crossing the Verrazano Bridge, and at one point I even felt the need to hang on to my step-daughter Emma who was running next to me. I could tell you how the headwinds in the South Bronx were so strong, that I actually stopped moving forward. For a few moments, I ran “in place”. No forward momentum. But, these were the conditions that everyone experienced. Everyone struggled, and we were one in that struggle. the journey – to make it to the finish line. Despite having lived and worked in New York City during the late 1980’s/early 1990’s, from the moment we arrived in Corona, Queens on Friday — we were tourists. We needed to get to the 7 train – to take us into Manhattan. This required taking the ’48 bus’ to the 7 train. We explained to the bus driver that we needed help finding the 7 train – and suddenly we had a bus load of new friends. “Friends” who were quiet, but helpful. Strangers who were willing to go out of their way, to make sure we found our train. Strangers, who for that moment, became our trusted friends. Friends who made sure that we knew how to use the fare card machines – and to further extend themselves to make sure we got on the train headed in the right direction. Then there were the strangers on the train, who befriended us and insisted that we take their seats. Of course I graciously refused. I hoped they didn’t consider me to be a senior citizen. Surely I have a LONG ways to go before I wear that badge. Jus Sayn. Once in Manhattan, we took our tourist badge to a new level. This is accomplished by staring up at the skyscrapers, with your mouth wide open and eyes bulging. New York City operates on such a grande level – the awe factor took over. We asked strangers for directions, and everyone we asked was simply delightful and helpful. We arrived at the Javits Center – a mega convention center – where the world class NYC Marathon event prep is held. Here, we pick up our runner bibs, ask questions about the race, and prepare to be overwhelmed by the sheer number of runners, volunteers and staff. I’m guessing that the resume for NYC marathon staff and volunteers includes years of training as “an angel”. Each staff member and volunteer made you feel as if you were the most important person they encountered that day. They looked you in the eye, patiently listening to your question, expressing NO urgency to move you along, and seemed genuinely glad to have had the opportunity to be at your service. 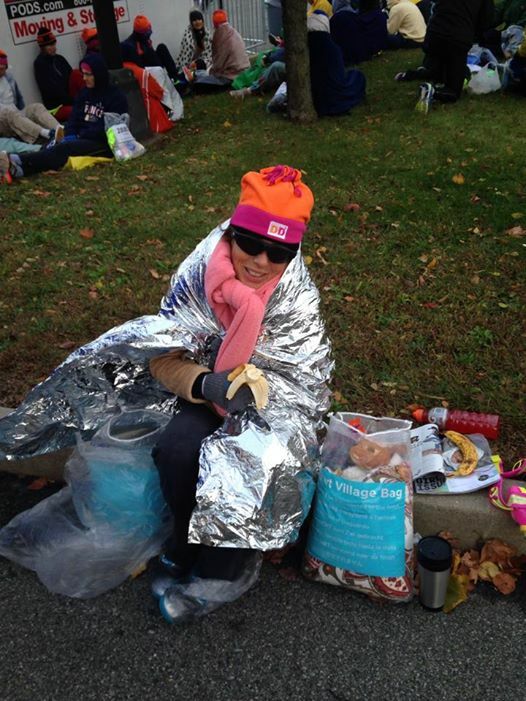 I’m pretty sure I want to be an NYC marathon angel when I grow up. And, that same kindness of strangers continued through NYC marathon weekend. From the staging village in Fort Wadsworth – including the cops, NYC marathon staff and volunteers, and the runners as well — it seemed as if kindness was the dominant flavor on the menu. Runners offered us extra food they had on hand, and offered other runners the chance to go to the head of the porta-potty lines – in case anyone had an urgent ‘need’. Volunteers were everywhere – making sure any question you might have — was fully answered. And this can’t be easy – considering the many languages and diversity of cultures in the NYC marathon. Foreigners make up approximately 50% of the runners. At every water station for 26 miles – not only can you get a cup of water or Gatorade – but the volunteer who hands it to you will tell you that you are doing “great”. Maybe they also tell how how far you have come. Or how much further you need to go. Or that it is all “downhill from here”. Or only a few more miles til you are in the next borough. The sincerity of their message is what stays in your mind. They truly want you to succeed. Strangers, who for a moment speak to you as if you are their best friend. And they do this over and over. For 50,000 runners. And then there are the angels with the double halos who work the Finish line area. These are the people who hold your hand after you have crossed the finish line. They say wonderful things as if they were a close relative. They put your Finisher medal around your neck, and then continue to say kind words. They notice that you are struggling with frozen fingers trying to open a bag of pretzels, and ask you if they can open that bag of pretzels for you. They notice you in a maze of thousands of runners – someone who is shivering during the mile plus post marathon walk through the finisher corrals. They bring you a wool blanket and carefully put it around you. But you are too stiff and clutzy at this point to hold the blanket and it falls to the ground. Two more volunteers come racing toward you and pick up your new wool blankie — and gently drape it around you – this time making sure that it won’t fall. You slowly walk your way to the final section of the finisher-chute, where the poncho-angels are waiting. The poncho angels wrap a beautiful, lined hooded poncho around you – and pull the hood over your head. They then ask you if it feels OK, while they continue to adjust the fit on you. You stand motionless in front of your poncho-angel, too cold to formulate words into sentences. 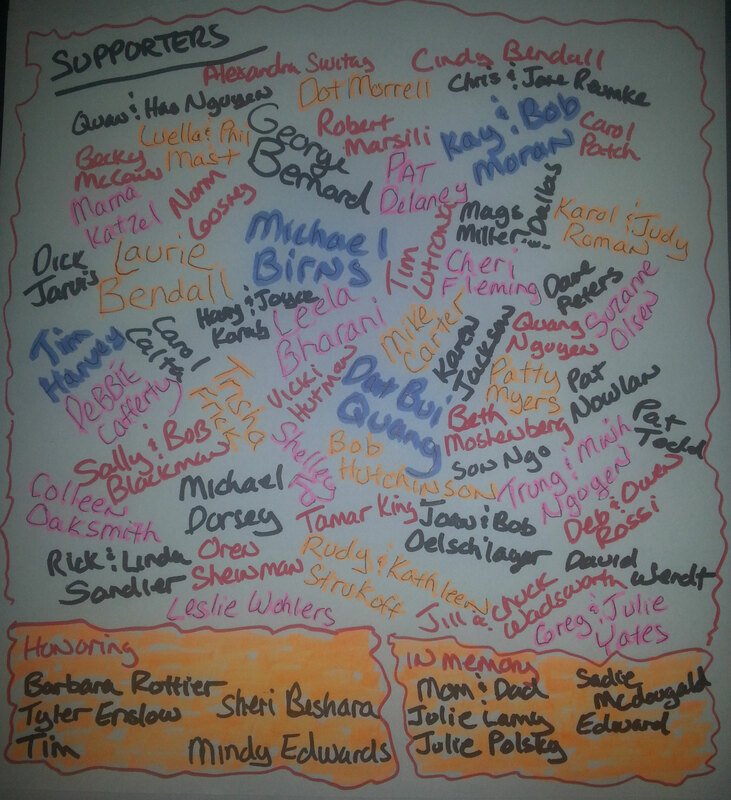 My incredible ‘village’ was more than the fundraising support for the Ulman Fund – Team Fight. You embraced this journey with me. You brought this event to life. We lived the dream together. 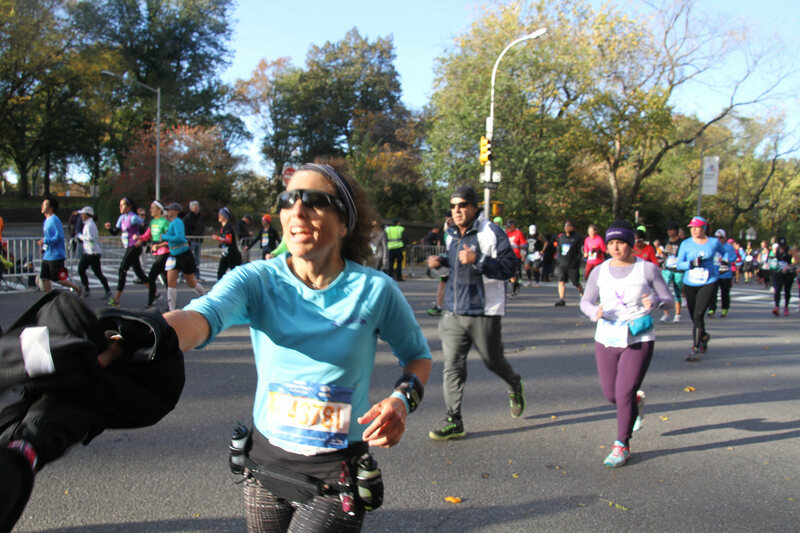 Your outpouring of emails, text and phone call well wishes and support – especially over the NYC Marathon weekend — really had an impact on me. I cannot begin to tell you how many times I thought about you before, during and after the event. I could not have done this without you. Yet, I was so worried that your names – that I wanted to so proudly wear on the back of my running shirt – would fly off in the gusty winds, that I had to make a last moment decision. I decided to tuck your names into my main pocket of my fuel belt. And I couldn’t think of a better place for you to ride. You became part of my fuel. Tucked away in my fuel belt – which holds only that which is critical to run a marathon — goo every 5 miles, water and Gatorade. So, technically you ran in front of me, safe in my fuel belt, safe from the winds. And, I was so glad to have made that decision. While running over the Verrazano Bridge, where the cross winds and gusts reached nearly 50 mph, I watched runners lose loose fitting clothing, hats, gloves and their hand made signs affixed to their clothes get torn to shreds. Not my village tho. You were safe with me. And you gave me 26.2 miles of strength. I ran with my step-daughter Emma up until approximately mile 9. It was at this point, that I began to feel the impact of the steady 20mph headwinds. I was already slowing. Emma is a strong runner, and I encouraged her to run her race without me. I was 1/3rd of the race done, and never had any doubts on finishing, but starting to appreciate the extra energy that would be needed to get to the finish line. The intense headwinds were wearing me down, step by step. 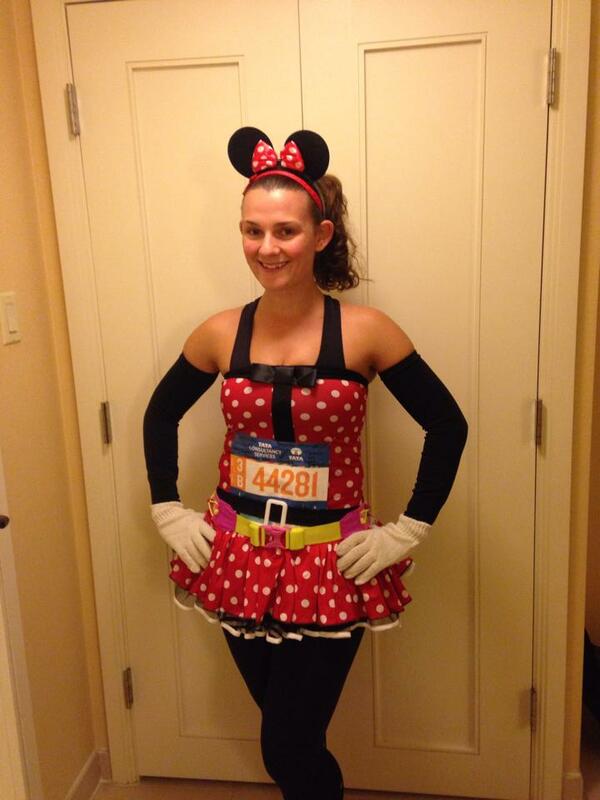 By mile 11, I saw Emma – decked out in her Minnie-Mouse costume, wowing the crowds – for the last time. I spent the remainder of my marathon miles focusing my thoughts on your lovely well wishes and kind support, feeding my Times Roman 9 voice, and knowing that by mile 14.5 I would get a boost of energy from Team Sherpa — family members Pat, Mike, Chuck and Jill. By the time I reached the Pulaski Bridge – which connects Brooklyn and Queens, many runners were reduced to walking. Not me. I refused to allow myself any walking unless absolutely necessary perhaps by mile 24. Right on schedule – by mile 14.5 – I noticed my Team Sherpa. There was no missing Sherpa Jill, standing tall with the added height of her Fluffy Russian Hat – and waving her arms frantically. I ran close and gave her a high 5 and a thumbs up. I knew the rest of Team Sherpa was nearby – and sure enough – Chuck and Paddy were working the cameras, and Mike was asking me if I needed anything. More high-fives, thumbs up and smiles for the camera – and I was off to tackle the Queensboro Bridge. I refused to admit to my Team Sherpas, or myself, how I was really feeling. I refused to admit that I was already experiencing lactic acid build up in my legs. The Queensboro bridge between mile 14 and 16 is one of the tougher climbs of the marathon. A long steady incline, devoid of any spectator support. When your legs start to lock up from lactic acid – your race is essentially over. Mechanically, your legs stop working properly. Your brain tries to tell your legs what to do, and how to move, and yet your legs just start to go “silly” on you. You begin to slow down. Your gait begins to change. 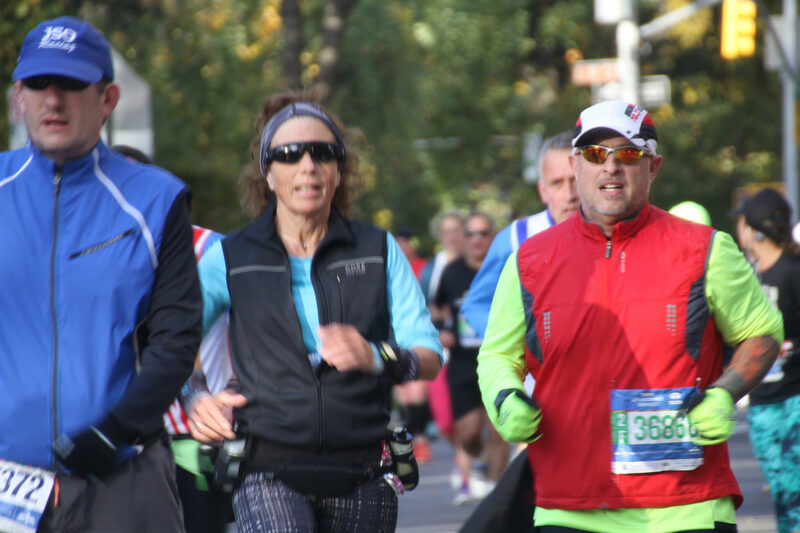 By the time I reached mile 18 along First Avenue in Manhattan – I threw the book of running instructions at my legs. “Try landing softer”, I told my legs. “Try bending your knees more”, “Try increasing your cadence”, and the list of instructions on how to move your legs went on like this for the next 5 and 1/2 miles. I had to keep running at least until I saw my Team Sherpa’s again at mile 23.5. This is what Team Sherpas do for you. You designate a “spectator spot”, and you do what it takes to look good for your spectators. Despite how you feel. I finally see that Fluffy Russian Hat again with the frantic waving arms. Jill of Team Sherpa has been spotted. I do my best job of sending running instructions to my legs – but mechanical failure has set in. I have become a running-zombie and my legs are just “goofy” at this point. I’m all smiles for my Sherpa Team — they have completed their own marathon of sorts keeping track of Emma (aka Minnie Mouse) and myself, trying to navigate a subway system that is jammed with other runner’s Sherpas, trying to cross streets that are blocked by an endless barrage of 50,000+ runners, to see their runner for 5-10 seconds, and then move to the next rendezvous point. 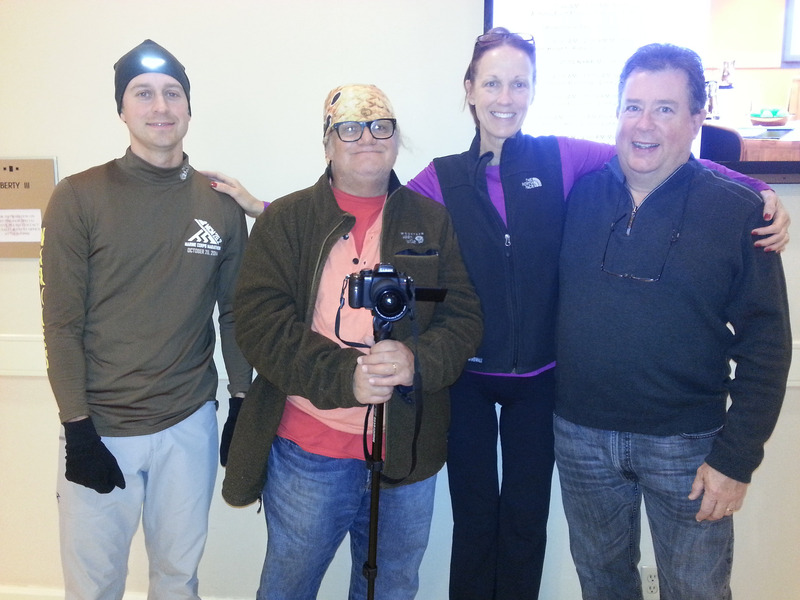 I willed my legs to head toward my Team Sherpa – and handed off some extra clothing that I no longer needed. At some point during mile 24 – I decided I might be able to walk faster than running. The state of my running gait was an outer-body experience – and completely unknown to me. I don’t know who those legs belonged to, I don’t recognize the running gait – and I surely have very little forward propulsion. Time for a new strategy. Fast walking. Apparently my legs remembered how to walk. As the masses of runners worked their way through Central Park, I noticed a lady walking next to me. At the same pace. Wearing the same light blue long sleeve shirt. After a few minutes passed, I looked over to her and asked “How are you doing?”. She shook her head and spoke a few words in Italian. Her name on her shirt was “Elaina”. Elaina from Italy. I didn’t speak Italian, and she didn’t speak English. I gave her a thumbs up, and she smiled and gave me back two thumbs up. We had connected, if for a moment, to make it to the finish. We walked together, at the same pace, and occasionally looked at each other and smiled. If I slowed for a few paces, Elaina looked back toward me as if she was concerned for her new comrade. I did the same. We looked out for each other. We were in this together. My Garmin watch began beeping. The message read “Battery Low”. I knew exactly how my Garmin felt – but this was no time to give up. I pressed the “Dismiss” button – which felt so right. Somewhere along Central Park South, I knew it was time. I gently touched Elaina’s arm, and nodded toward the finish line. I started to run, and Elaina joined me. We encouraged each other silently, with our eyes and smiles, and crossed the finish line together. 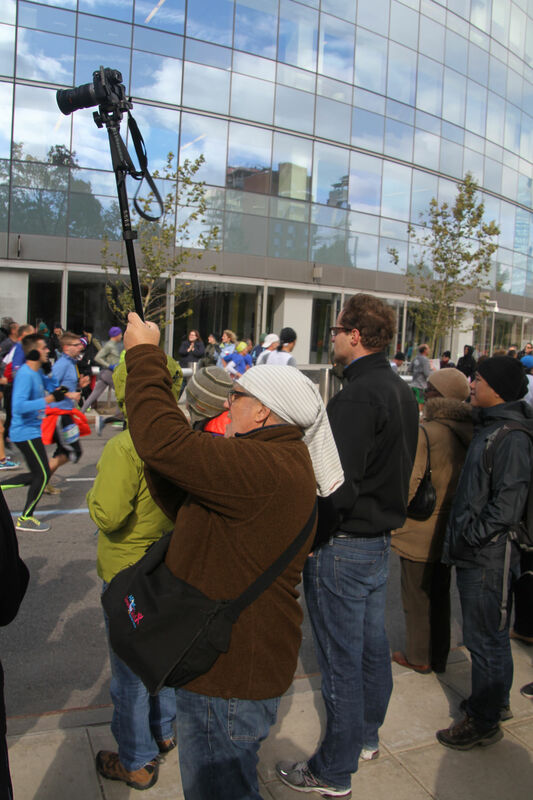 It was everything I could have imagined the NYC marathon to be. It was an epic journey. Thank you for being a part of this ride with me. More photos –and Video of the run from my iVue Sunglasses!